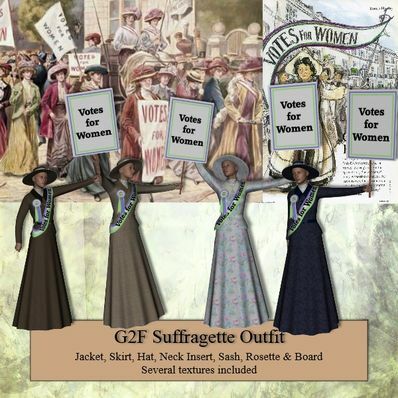 A Suffragette Outfit for Genesis 2 Female for use in Daz Studio 4.6. Jacket, Skirt, Neck Insert, Hat, Board, Sash & Rosette plus a Hand and Arm Pose to hold board. Thank you! After years working solely in V4, I'm finally starting to get seriously into G2F. I got the last little push from Daz's gorgeous Edwardian outfit and accessories released this week and am delighted to find you've already been exerting your own efforts in that era. The sash - I was looking for something like this but didn't know where to look - will be perfect for use (retextured, of course) with Edwardian-era royal gown renders! Excellent outfits and props to go with it. Victorian stuff is hard to come by and these will definately come in very handy with some ideas I have all Victorian.. Brilliant work, your so talented and gifted I just love all your stuff.. Great work.. These are brilliant, in fact they are all brilliant. I'm just so chuffed to have spotted your link on the forum today. I can't believe you gave us even the boards, and all the other goodies as well. You are the best!! My suffragette ancestors thank you! Nicely done Wendy. Thank you very much. We have so little Edwardian clothing sets and with Downton Abby being so popular this is a nice addition. it's utterly sickening women had to fight for the right to vote in the first place. We need to honor our struggle by voting each time, every time! A very good outfit - and a wonderful idea. Those women took great risks for their aim and should not be forgotten. Wow! Looks really good! Thank you so much! Bonjour, Travail remarquable. Merci beaucoup.